Rather, this was me. This morning. This is a straight up BEFORE picture. Do you hear me Paul Mitchell? 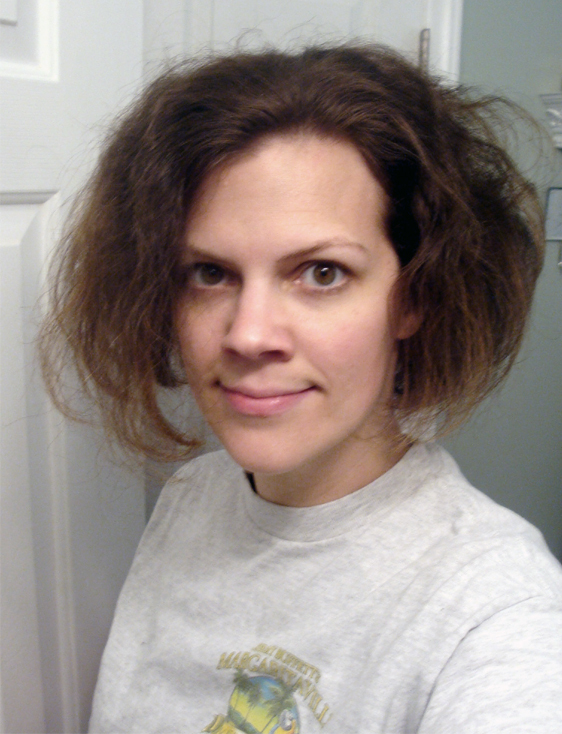 I am available for any and all “bad hair” infomercials. Not convinced? Read on. 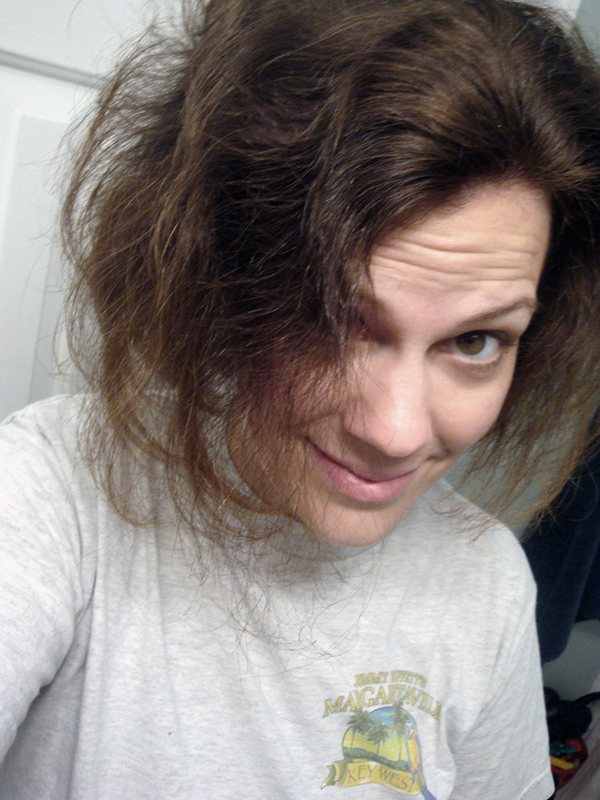 See, last night I decided to wash my hair. But not wanting to run the hair dryer after Oscar was asleep, I just combed it and let it air dry. The affect of which I didn’t really understand until looking into the mirror this morning. I should have known though because when Oscar needed me in the middle of the night I went in and he couldn’t even look me in the eyes. His gaze just drifted quickly north and then froze. I thought maybe because I had on my glasses? Only then I turned around and saw this. 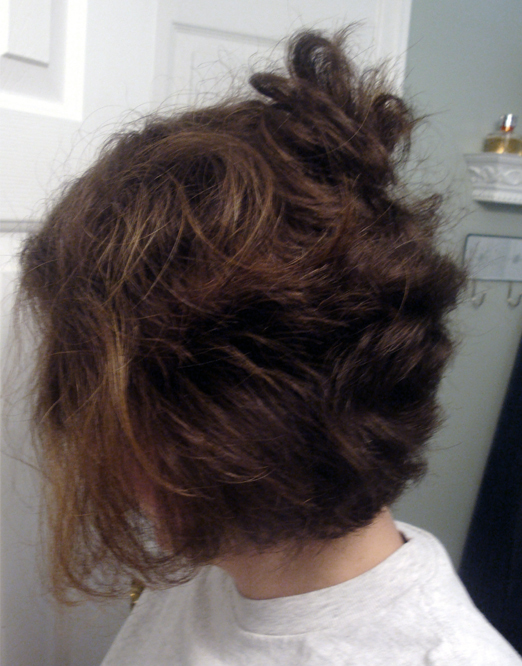 I am fairly certain that while I slept, a robin came and nested on my head. On my honor, I swear I did nothing to make this look worse than it really was. This is my actual hair, actually standing STRAIGHT up. Jerry said, “yeah when you got up in the middle of the night I was like….whoa.” Hey, thanks babe. I mean can we talk about this? My HAIR is standing STRAIGHT up. How does that even happen? I was sure my little $20 hair straightener would laugh at the task of fixing this, but I got to work anyway. I was not optimistic. Somehow I got the front done, but needed to bring in the big guns for the back. See? That’s my hubby and those are his big guns. What you don’t see here is that he was actually brushing his teeth when I called him in urgently so he has the toothbrush hanging out of his mouth. That’s love. And finally, after not too many minutes, I was back to my old (new) self! Though now I kinda wish I would have left it. It would have been fun to scare the kids at the park. Oh and Paul Mitchell? Call me. You are braver than me. I've started going to bed with wet hair, and I keep a ponytail holder by the bed so that I can pull it back before I even look in the mirror. It's so bad that the women in the mall don't even offer to straighten my hair at their kiosk. You are just too adorable! I don't think I've ever seen a person's hair do that before! Not even my son's bedhead can beat that (the cute little fluffy duck head). awesomeness! i washed my hair with handsoap at the pool shower last night just to get out the chlorine. 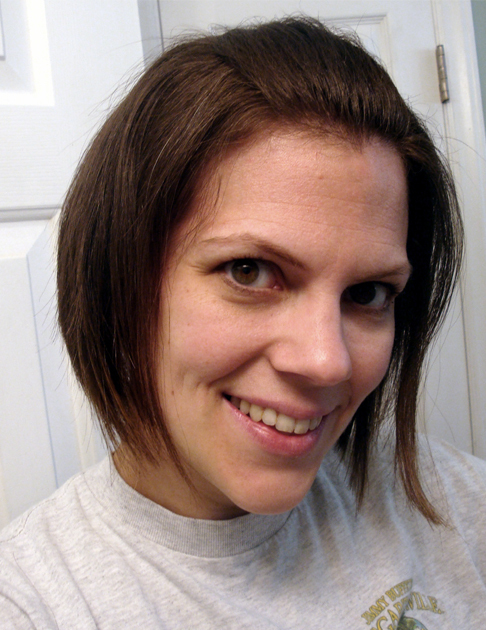 and, even though my rubber band had fallen out this morn, my hair was STILL pulled back like it was in a ponytail. so with you. Oh I'd love to get it from you before we leave! I love that you posted this. Hilarious. You are hilarious! That is some EPIC bedhead!! 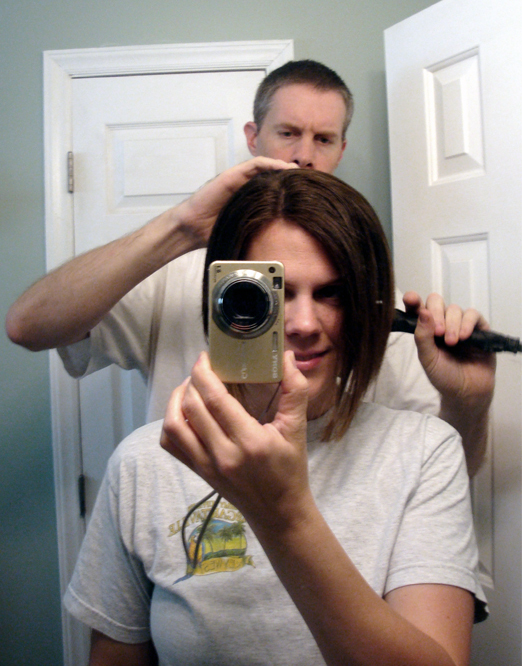 Also, love the hubs wielding the flat iron. Classic!